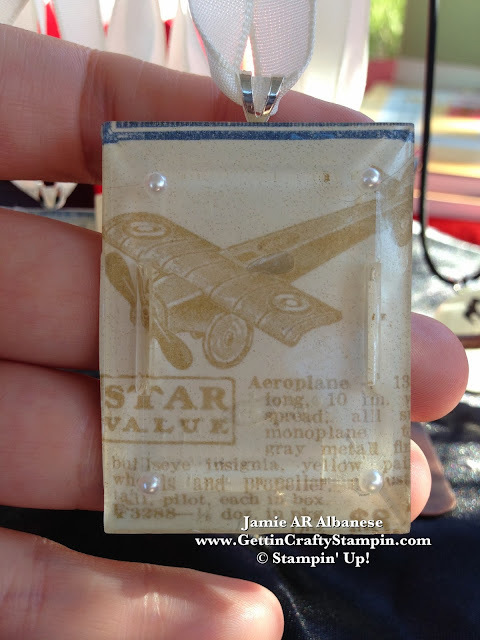 Getting Crafty with Jamie: Necklace Fun, Repurposing your Fancy Paper and Ribbons into a Gift! 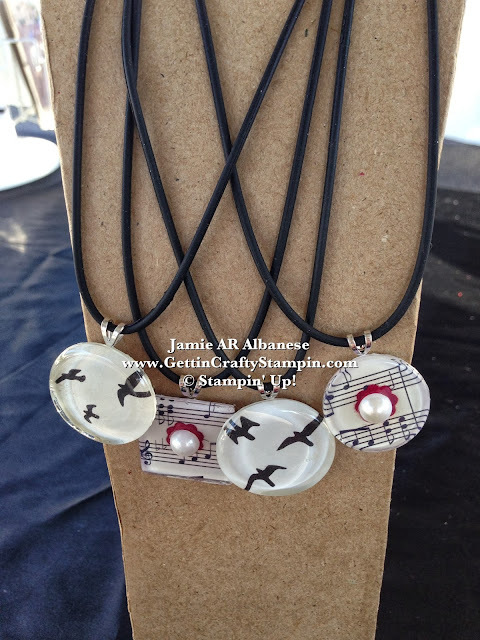 Necklace Fun, Repurposing your Fancy Paper and Ribbons into a Gift! Sometimes Paper Crafting is more than just cards and scrapbooks (say it ain't so! - lol). Using the Scraps and Pages you love to create a gift is a great way to show you care while the paper lives on in a new form! Give a new life to those scraps of paper and ribbon in a long lasting gift! Creating these stunning necklaces was fun and easy to do! First grab one of my favorite tools, the Crystal Effects (#101055) liquid adhesive. Using retired buttons and these glass medallions with our Modern Medley Designer Series Paper (#126926) and our Cherry Cobbler card stock (#119685) punched out with the Itty Bitty Shapes Punch Pack (#118309 for three cute punches) to create an accent color. Adding the adhesive backed Large Pearl Basic Jewles (#125577) for a classic accent. Here I used the stunning and vintage Etcetera Designer Series Paper (#130129) where these retired Beveled Window Panes create beautiful hanging portraits of vintage advertisements! Square accents are all the rage.. old, clear square buttons would work, too! Repurposing these items is a great way to be on trend while giving a classic gift! Accenting these beautiful images with our adhesive backed Pearls Basic Jewels (#119247) for these tiny pearls that lend towards the elegance and vintage images! Having always wanted to get my pilots license (some day - after the little ones are older, lol)... this image was near to my heart... and the Vintage aspect captured my old soul heart. Adhering a Bevel to the back of the image (after the Crystal Effects dries) it now is ideal to wear as a necklace or hang in my car from the rear view window. The Vanilla Taffeta Ribbon (#109070) reminds me of how they'd wear accents in the Victorian Era! OK so I wore this lady on my chest all day... and have sported her since. 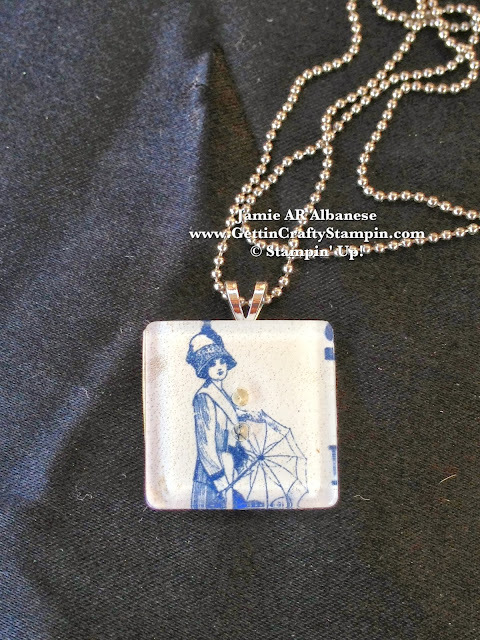 Her roaring 20's hat (I own one or two in this style, lol) and the beautiful blue... framed behind this retired clear square button lends to the style of the age, too! I've received a few compliments on her... isn't she worth wearing?? I love that you came by today! 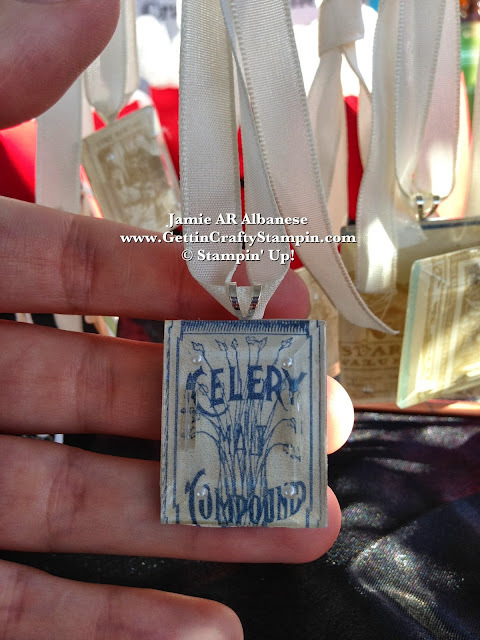 Do YOU want MORE Gettin' Crafty Stampin' fun?? CLICK HERE to Join me in my on-line and in-person classes and clubs that are waiting for YOU!! Do YOU want Exclusive Benefits, tutorial and specials?? 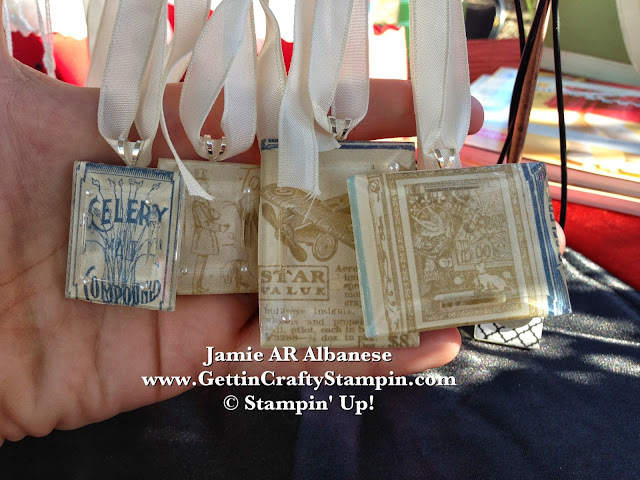 Join the Gettin' Crafty Stampin' Mailing List! CLICK HERE for More on this fun club... and Invite your friends and family to join in on the fun, too!! Go ahead, go beyond card making and journaling or scrap booking! Create something pretty that will live on from your scraps or even a sheet you pick out specifically for it's beauty! Giving a gift like this will sure to be near and dear to someone's heart... I'm wearing a bird necklace now and have received a few compliments on it today! It's warm, fun and lays on my heart. Give a gift that will life a new and special life, or wear it like I do! !